The Rocks are into the next round of the Sussex Senior Cup after they came back from 2-0 down to beat a strong Three Bridges side 3-2 at rainy Nyewood Lane. Second-half goals by Mason Walsh, Tommy Block - back from his trial at Hibs - and Dan Smith earned Jack Pearce and Robbie Blake's team a place in the fourth round. Missing was striker Bradley Lethbridge, out with a niggly injury, while midfielder Doug Tuck was on the bench. Jamie Carroll got a start as well as Pompey loanee Freddie Read as the Rocks gave a couple of youngsters game time. Early on Ibby Akonbir crossed from the right after using his pace to beat his marker but his cross was headed away. Connor French beat the defence with his pace following a pass down the line by Joe Tennant and he cut inside before shooting but Dan Lincoln was well positioned to push the ball back out on seven minutes. Harvey Whyte stole the ball in the Bridges half but after Walsh's cross found Smith he passed back to Tommy Scutt, who was blocked. Then Walsh's follow-up was well stopped by James Shaw. Smith was sent through with a neat pass but his shot was easily saved by Shaw on 15 minutes. Carroll intercepted a Three Bridges attack and Smith passed to Jimmy Muitt who set up Calvin Davies. His shot forced Shaw into a save. Block got in the way of Akonbir's low strike. Brannon O'Neill's corner kick found Olumide Oluwatimilehin, whose decent header had to be acrobatically pushed away by Lincoln. On 22 minutes Three Bridges took the lead as the Rocks failed to deal with a corner, Antone Douglas finding space following a failed clearance to blast beyond Lincoln and into the net. Soon Alex Clark ran on to a ball over the top by Jenson Grant but after beating his marker who had fallen, his shot was straight at Lincoln. Patient build-up play from the Rocks on the right failed to pay off as Muitt's low cross skidded across the box and out of play. Smith got a shot away the ball was easily gathered by Shaw on 35 minutes. Walsh lost the ball on the left and a long ball along the deck found French who beat Block with his run. But French smashed the ball low and wide of the far post. It got worse for Bognor as they went further behind on 43 minutes when Three Bridges sprung on the counter attack. Akonbir's diagonal ball split the defence and found Clark, who did well to beat his marker before shooting low and into the bottom corner. In reply, Scutt's square ball found Whyte, who hit it early but wide. Tuck replaced Carroll after half-time for Bognor and the Rocks knew they needed to improve. A wonderful cross from the corner by Muitt found Smith, who nodded it at goal - but Shaw was equal to it. But Bognor got a goal back on 50 minutes. The ball was cleared from a cross and Walsh latched on to it on the corner of the box to curl the loose ball into the top corner to give the Rocks hope. Scutt forced a diving fingertip save from Shaw moments later, winning another corner. Collins went into the book on 53 minutes and the Rocks levelled the scores a minute later. A cross from the left by Walsh was curled in and Block was unmarked to head it firmly past Shaw. Muitt's cross was diverted by Shaw before Smith could get there. Then Smith teed up Scutt, but he struck it wide. Muitt swung the ball in along the deck to Smith who hit the post with his shot on 67 minutes. Farouq Odeshina replaced Clark on 69 minutes for the visitors and Bognor took the lead for the first time soon after. Davies was the provider from wide on the left and his chipped cross was met by Smith, who nodded in with Shaw stranded on 71 minutes. Chad Field's forward pass found Smith, whose Shaw again forced Shaw into a fine stop. Muitt's corner fell to Block but his header was feeble and easily saved. Smith found Scutt with a through pass but he shot wide with the goal gaping on 76 minutes. French scuffed the ball high and wide on 79 minutes after he worked it into space in a rare second-half attack for the visitors. Smith was replaced by Jimmy Wild and for the visitors on came Omar Folkes for Grant on 82 minutes. Wild was immediately blocked with an attempt at goal following good work from Whyte. Collins was replaced by Mason Doughty on 85 minute for Three Bridges. The visitors' last chance to save the day went begging when Akonbir hit an effort high and well wide on 89 minutes. 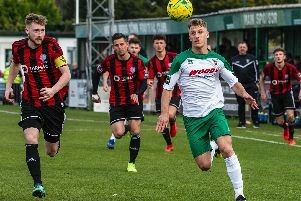 So - not for the first time this season - Bognor were the comeback kings in an improved in the second half. Rocks: Lincoln, Davies, Carroll (Tuck 45), Read, Field, Block, Whyte (c), Scutt, Smith (Wild 82), Muitt, Walsh. Subs not used: McCormick, Osborne.